First we illuminated a spot on cheap white printer paper and pointed the camera at that. The colored spot did not fill the frame during the white balance procedure, but it could have had we moved the camera closer. Then we put the LED inside a frosted glass globe. The color field filled the frame, although it was brighter near the center, especially with the bright blue LED. We compared results with white balance done with blue origami paper under blue sky in the shade (BG3 camera) or red origami paper in direct sunlight (Wratten 25A camera). 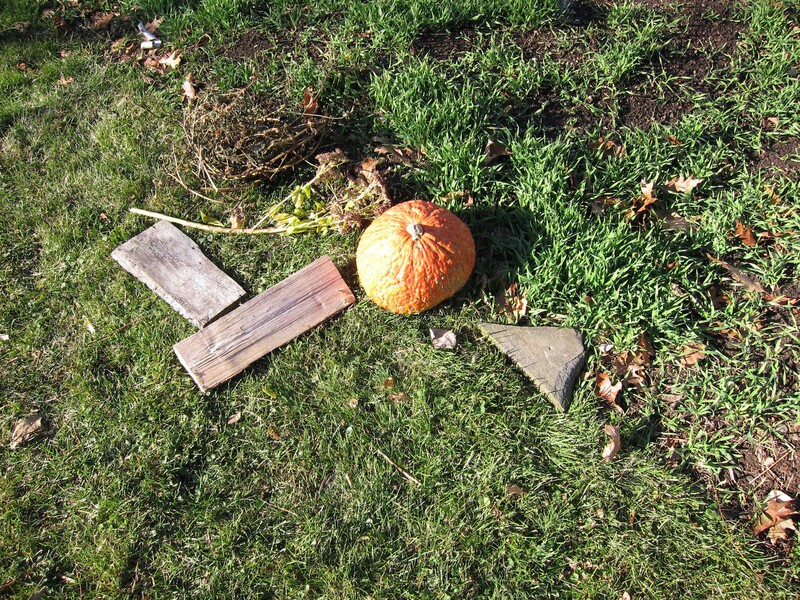 We took test photos of a scene including lawn, young winter rye, an orange pumpkin, a gray stone, bare wood, dry oak leaves, and some dying plant parts. The false color IR images below were made in Photoshop by swapping various color channels and making other adjustments. The NDVI images were made in Ned's Fiji plugin by using the red and blue (Wratten 25A) or blue and red (BG3) channels to represent visible and NIR light, respectively. Both histograms were stretched (parameter=5) but no other adjustments were made. . The red LED illuminating white paper. 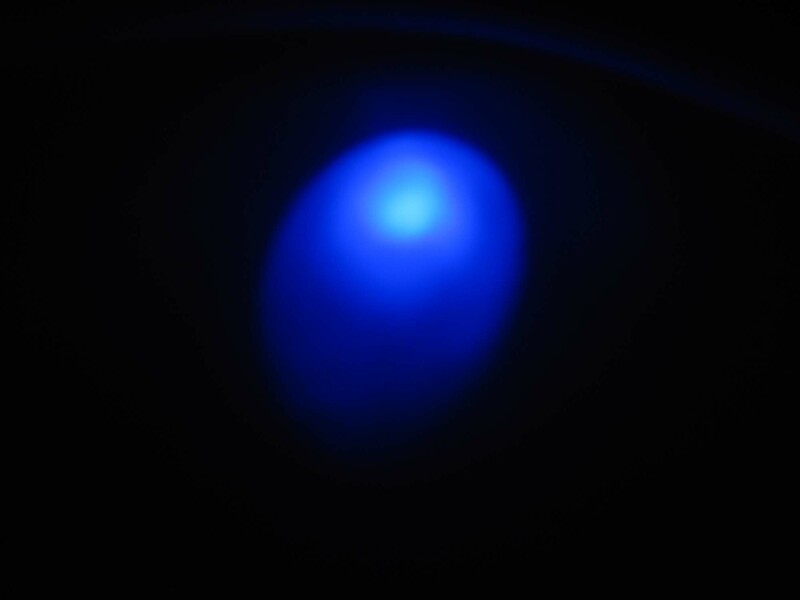 The spot on paper illuminated by a blue LED. The test scene. Lawn is to the left, winter rye to the right. 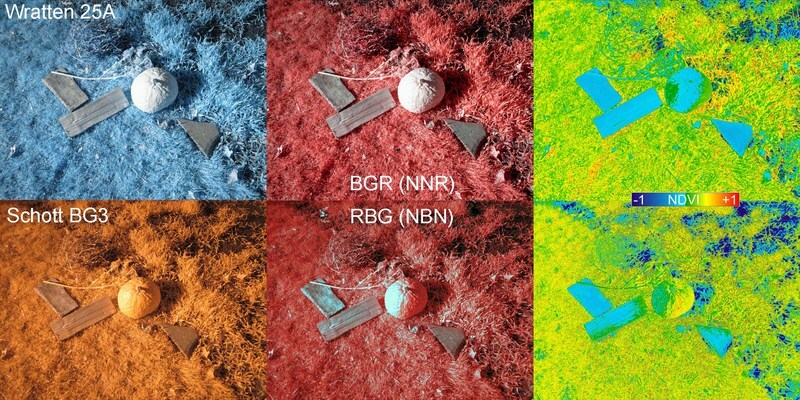 Photos, false color IR images, and NDVI after white balance on LED illuminated paper. Upper row: Wratten 25A. Lower row: Schott BG3. 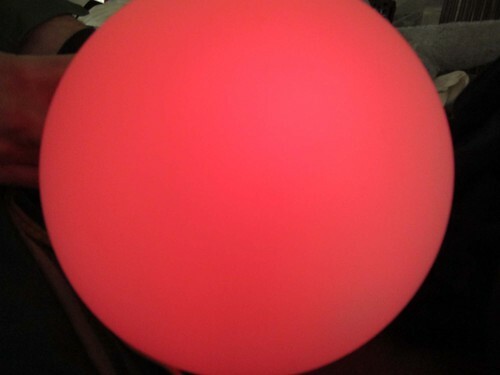 The frosted globe illuminated from inside with a red LED. Photos, false color IR images, and NDVI after white balance on a frosted globe illuminated from inside with an LED. Upper row: Wratten 25A. Lower row: Schott BG3. The test scene for the origami paper tests below. The first scene got shaded while we discussed important things, so everything had to be moved back into the sun. Photos, false color IR images, and NDVI after white balance on either red (upper) or blue (lower) origami paper. Upper row: Wratten 25A. Lower row: Schott BG3. Either method of using LEDs for white balance produces results very similar to those using origami paper. The BG3 photos straight from the camera are a little redder with LEDs vs origami paper, but the false color and NDVI images are similar. Among the BG3 NDVI images, wood and stone were more clearly differentiated from plants when the camera was white balanced with origami paper. It appears that using LEDs might be a good way to standardize the white balance procedure. Anybody can purchase identical or similar LEDs very inexpensively. White balance no longer must depend on having a sunny day. This will have to be tested for CMOS Powershots which do not behave the same as CCD cameras. False color IR images from the Wratten 25A (red filter) camera are a little better than those from the BG3 (blue filter) camera at discriminating between plant and non-plant. However, I have learned some Photoshop tricks for making them look similar. NDVI images from the Wratten 25A (red filter) camera are a little better than those from the BG3 (blue filter) camera at discriminating between plant and non-plant. 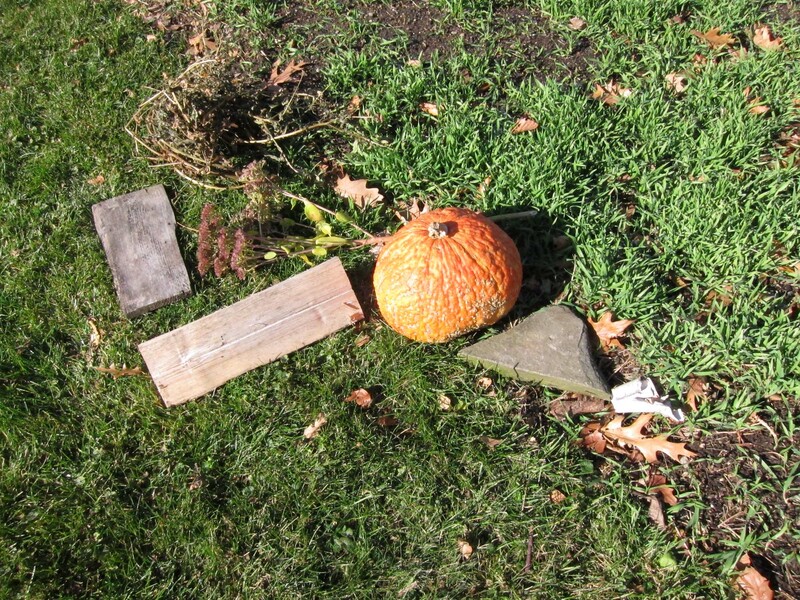 Orange pumpkins always look like green plants to the BG3 (blue filter) camera because pigments in the pumpkins are absorbing at the blue end of the spectrum where the BG3 camera gets its visible light data. I'm interested in something similar for spectrometer exposure calibration -- putting an LED and battery inside each spectrometer, on one side, so you get a spectrum of known brightness and response every time you capture a sample. But it raises similar questions -- are a given run of LEDs very consistent in their wavelength curve and intensity? Would the LED have to be placed outside the entrance slit? Otherwise the grating would form an image of the entire bulb. 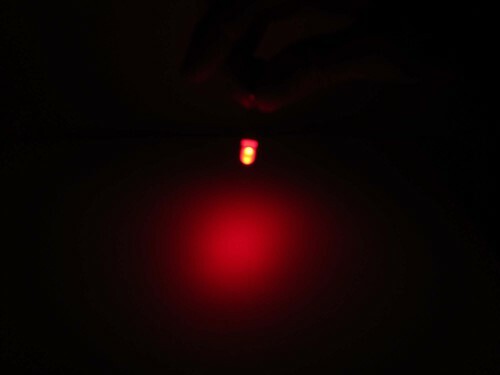 Standard single color LEDs do not have narrow peaks, so even outside of the slit they would form a broad band. The advertised bandwidths of 2 to 10 nm ignore the wide tails which typically seem to cover 30-40 nm. So they are maybe not so useful for wavelength calibration. For intensity calibration I guess the battery current would have to be constant across multiple uses. Depending on the brightness of the sample spectrum, the LED spectrum would influence exposure, for better or worse. I would like to know how glow in the dark paint compares to LEDs. Postcards with glow in the dark rainbows painted on them could be packaged with spectrometers or sold for a few dollars a each. Meta-data about the creation date and paints used could be included in a QR code in order to automate calibration with greater accuracy. Maybe other pigments have narrower bands and sharper peaks for wavelength calibration, but maybe not. It would be cool to charge up a patch of this paint with a UV LED and then immediately use the emission glow to calibrate spectrometer intensity. Maybe a thin line could be painted inside and parallel to the entrance slit so it was captured in every spectrum. Maybe an internal UV LED could be on all the time since it would not show up in the visible or IR spectrum. But unless some glow-in-the-dark pigments have much narrower peaks, the emission would overlay the sample spectrum. So the pigment line would have to extend the line of the entrance slit instead of being parallel to it so its emission spectrum was separate from the sample spectrum. I recently ordered a smartphone spectrometer, measuring glow in the dark pigment spectra seems like a fun project to try it out on. I'll give it a shot if I have time in the future. If anyone has suggestions for paints to try or experimental setups to use let me know. I think it will be important to measure how intensity varies based on charging method and how long ago the paint was applied. I've started experimenting with phosphorescent paint. Here's a link to a note on what I've done so far.